Time is a little short for stamping. There are so many details I still need to take care of for this move but this couldn't be overlooked. My daughter celebrated her 16th birthday last month and I didn't have enough thank you cards for her. Rather than a thank you, I made general note cards. 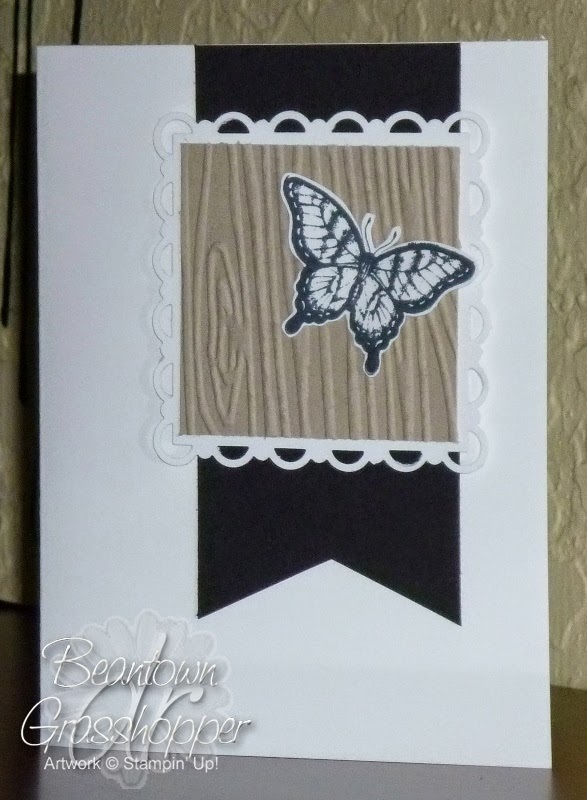 I saw a thank you card on Pinterest that used other supplies than Stampin' Up! Have no fear, I could recreate it with what I had. While I could have made the banner for the 'thank you' sentiment, I liked it without it. To make the scalloped square, I cut the CS to a 2-7/8" square. I went through a whole sheet of CS to figure out the dimensions to punch it easily. The banner is 2-1/8" wide, I think 2" would be better. To cut the bottom, I used my paper trimmer and cut in 1/2" into the center and then used my scissors to cut from one corner to the center and then did the other side.